BISS GCH. Silhouette's Dirty Harry-- Ranked 13th in Breed Standings and 18th in National ChampionshipStandings Dirty Harry is now ranked 15th in 2013 Breed Standings for the whole year. He is also ranked #14 for the Canine Chronicle Weekend Breed Standings for year of 2013! 07/12/14 Dirty Harry Placed 4th in Working Group show ring at Shawnee Kennel Club in Woodstock, VA! Thank you Whitney Coombs for giving Dirty Harry a nice group placement and Carol Filer for showing him. 06/29/15 Dirty Harry placed 2nd in Working Group in Tidewater Kennel Club Of Virginia. Thank you Doug Halloway Jr. for the wonderful group placement for Dirty Harry and Shawnee Imler for showing him. Great Job! This nice boy as a pup has been doing very well in the show ring. I would like to thank Carol Filer for showing and grooming this wonderful boy.I would also like to thank Tom Decanso for giving Harry a wonderful home and having him shown. Harry loves to show and is energetic. He has powerful movement, nice coat, nice topline and nice neckline, beautiful teeth and great attitude and georgous to watch in the show ring. To date Harry has 15 points and 4 majors and he is a New CHAMPION! Congratulations!!! As to date he has 26 points and 6 majors and has completed his Grand Championship. Congrats once again on a great ride. Dirty Harry is #10 in Grand Championship Standings and #9 in All Breed Standings for 1/1/15 to 10/31/15 and #8 in Breed Final Standings.Very proud of Harry!! 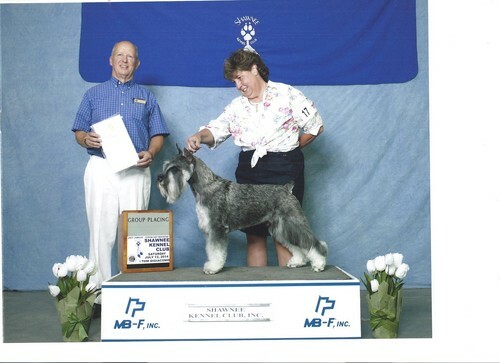 Dirty Harry has won 3 Best of Breeds with 5 point majors towards his Grand Championship with a large entry of dogs. He has done so well for Carol Filer and they work well as a team. Thank you Carol for doing such a great job of grooming and showing Dirty Harry.I would also like to thank Tom for letting Carol Filer show Dirty Harry to his Grand Championship. He had some nice wins and is a faboulous show boy.